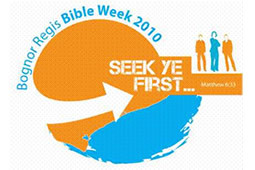 Once again organised by Christ For The Nations UK, hosted at the Regis Centre, and running from the 19th - 24th September 2010, the third annual Bognor Regis Bible Week was a great success. All the speakers brought clear and powerful words of encouragement and challenge to seek first His kingdom. The morning sessions by Lord George Carey were excellent as was the evening session at which he spoke. The talks are available as a 5 or 6 talk set, on both CD and MP3-CD. The evening talks given by Ishmael, Robert Maasbach, Greg Haslam, Jennifer Rees-Larcombe and Raymond Pfister were all highly challenging and we can personally testify how impacting were the things they had to say. All 11 studies given at the Bognor Regis Bible Week 2010 are available as a 11-Disc set. At only £25.00, this collection represents a fantastic bargain. The MP3 CD of all 11 of the studies given at the Bognor Regis Bible Week 2010. All 5 of the morning Bible studies given by Lord George Carey on The Epistle to the Ephesians. All 6 talks by Lord George Carey on The Epistle to the Ephesians & Life in All its Abundance. The first of the morning Bible studies by Lord George Carey entitled 'Heavenly Blessings'. The second of the morning Bible studies by Lord George Carey entitled 'The Family that Longs to Embrace You'. The third of the morning Bible studies by Lord George Carey entitled 'Power Rooted in Love'. The fourth of the morning Bible studies by Lord George Carey entitled 'Gifts to Build Up the Body'. The last of the morning Bible studies by Lord George Carey entitled 'Relationships that honour God's Kingdom'. The Wednesday evening Bible study from the Bognor Regis Bible Week 2010. The Sunday evening Bible study from the Bognor Regis Bible Week 2010. The Monday evening Bible study from the Bognor Regis Bible Week 2010. The Tuesday evening Bible Study from the Bognor Regis Bible Week 2010. The Thursday evening Bible study from the Bognor Regis Bible Week 2010. The Friday evening Bible study from the Bognor Regis Bible Week 2010.